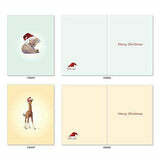 10 ASSORTED CHRISTMAS CARDS - Inside text reads "Merry Christmas. 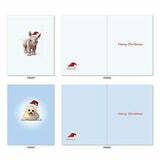 " If you're looking for the perfect season's greetings cards for friends and family of all ages, then look no further! 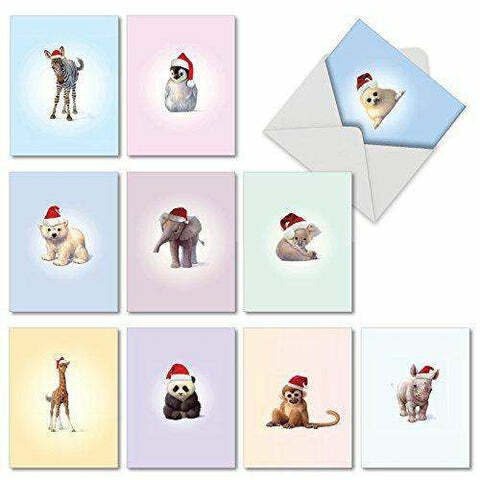 These adorable cards feature baby zoo animals dressed to deck the halls in red Santa hats. Go ahead, say "Aww. " We know you want to. All mini cards ship with envelopes & arrive in a reusable box. 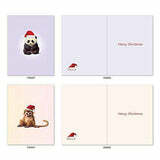 MINI GREETING CARD SET - Our (4" x 5.25") note cards are smaller than a typical 5 x 7. 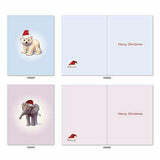 These super cute holiday cards showcase baby zoo animals, like a wobbly legged zebra and tiny elephant, wearing santa hats. C'mon BABY, order now! We offer a wide assortment of designs and art styles, offering a unique match for men and women looking for the right note card for their special, personal message. WISH A HAPPY HOLIDAY - These cards are perfect for wishing friends, family, neighbors, and coworkers a happy holiday. Give the gift of a card with your own written sentiments. Tis' the season to send cards! A variety of the art and designs in our note card sets look great framed! Try framing them individually, or grouping several in a collage frame, to create visually appealing wall decor. ABOUT THE CARD - Keeping US jobs at home, most of our products are Made in the USA (some printed in Canada) and have been for more than 38 years, unlike our off-brand Chinese competitors! We print our greeting notecards on snow white, thick, recycled card stock, made from renewable farmed trees. Our Print on Demand technology is eco friendly, reduces waste, and minimizes environmental impact.